Oh, I wish I could hold one of these ethereal beauties in my hand and feel the wings tickle my palms. I never will, of course, as it certainly wouldn’t be good for the bird. Still, I like to imagine it as I watch the birds come to my garden. Thanks, Judy! 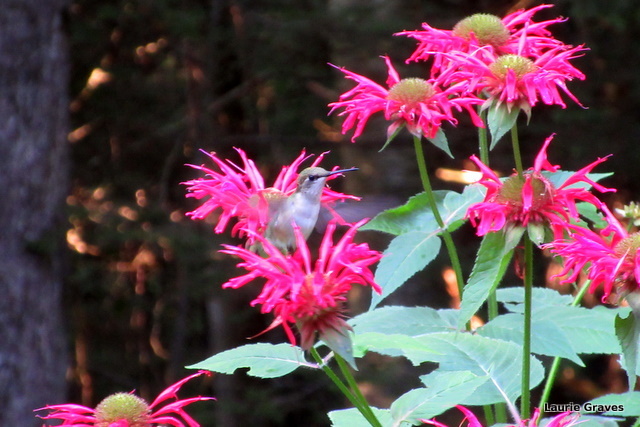 Well, bee balm and hummingbirds go together like peanut butter and chocolate. A wonderful flower to have in bloom this time of year. Bees love it—of course!—as do the hummingbirds. And, it has a wonderful fragrance. Beautiful! I love the hummingbirds, too. I once saw one put his beak into a tube of bee balm and when he backed up, the flower tube was still stuck to he beak. He had to shake his head back and forth to get it off. Such a funny story, and how lucky you were to witness the event. One of those moments when I was sitting still rather than scurrying about in the garden. I need to remember to do more sitting. I know just what you mean! Too much scurrying, not enough sitting. But on this delightful August day in Maine, I plan to do some sitting on the patio. What a wonderful capture! Your timing was perfect! They are such graceful creatures!